The Palace Hotel Helsinki enjoys one of the finest locations in the city overlooking the harbor, and is just a short stroll away from many of the city’s popular sights and shopping areas. The City Tourist Office, Aleksanterinkatu, Museum of Finnish Architecture, and the Helsinki Cathedral are all within walking distance of this hotel. 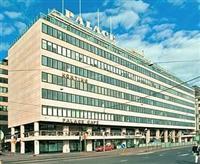 Parking facilities are available at the Palace Hotel Helsinki for an extra fee. Thirty-nine cozy guestrooms are available in the Palace Hotel Helsinki, 21 of which are junior suites. Each room is well-furnished and equipped with a host of modern amenities. This property was built in 1952, the year of the Helsinki Olympic Games. Though the hotel has been updated since it was first built, it still retains some of its 1950s charm. Guests can start their day off with a delicious breakfast served in the Palace Hotel Helsinki’s breakfast room, which offers a gorgeous view of the harbor. During times of leisure, guests can socialize with friends in the hotel’s lobby or go out and explore the city and its myriad of attractions.